Murphy Square is a publication of the Augsburg community, a collection of short stories, essays, poetry, and visual arts created by students, faculty, and staff of the College. 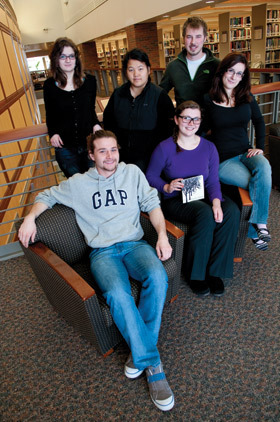 Below Augsburg College students and a professor of English share their thoughts about the importance of this journal. You can submit to the 2012 edition of Murphy Square through Friday, Feb. 3. Email murphysquare@augsburg.edu with your art or written work attached as a document. Your name should not be on the file. Put your name and the title of the work in the body of the email. Email olsoncar@augsburg.edu with questions. Pictured here is the Murphy Square editorial staff. Murphy Square has been a part of the Augsburg Community for over 35 years. This literary and art journal has provided hundreds of students the opportunity not only to share their writing and art, but also to experience work as editors. Many professional writers had their first editing experience and publication in a student magazine. Murphy Square is a fine example of the power of a liberal arts education! Murphy Square is the greatest opportunity a writer or artist has to begin their career, because submitting to galleries, contests, newspapers, publishing companies and other literary journals is what a working writer or artist has to do in life. Why not start now?" Writing helps the writer see their own thinking. This is what I love best about writing." Art is so important to us as human beings. There is no better way to communicate emotion than through the reading of others' writing and the expression of visual art, and Murphy Square brings our entire Augsburg community together to express and feel and share with each other. Art brings us entertainment, passion and clarity by imitating our lives. Murphy Square brings these snippets of our lives into a collection of what it means to be an Augsburg Student living in thriving city. As college students, a lot of us are still unsure about where exactly life is going to take us. However, the opportunity to see our name in print on something that we are proud of can provide the motivation we need to push through the hardships and self-doubt and allow ourselves to be who we really are. Murphy Square is not only a place where anyone can get his or her work published and read by the entire Augsburg community, but it is a highly valuable learning experience for students who want to learn the process of editing, putting together, and publishing a professional quality journal. Being on the editorial board of Murphy Square is like participating in a year-long publishing and editing course during which the board members gain leadership, management, and marketing skills that will be applicable to any future real world situation. Writing is not just some hobby I enjoy doing in my spare time, it is something that is a part of me as an individual and "what I bring to the table." It is something that allows any one of us to express what we are truly thinking and feeling at any given time and then gives us a chance to share those ideas and understandings with the rest of the world. Murphy Square is imperative to Augsburg because it is a collection of publications which tell a story of that year, years prior, and many years to come, and is the means for many students who want to leave their footprint for the rest of the years to come.